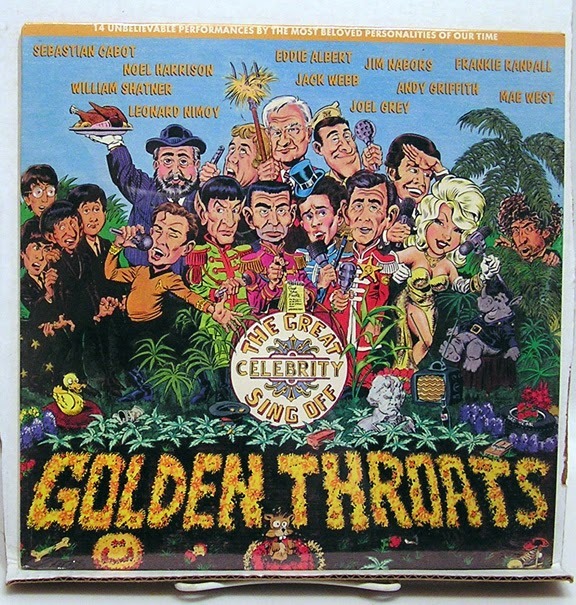 Stephen W. Terrell's (MUSIC) Web Log: WACKY WEDNESDAY: The Revenge of the Golden Throats! WACKY WEDNESDAY: The Revenge of the Golden Throats! Back in the '80s and '90s, when Rhino Records was actually a cool label, they released a series of albums called Golden Throats. These nutball compilations featured movie and TV stars, sports heroes and every stripe of cheesy celebrity singing ham-fisted versions of songs they had no business singing. Pop tunes, rock 'n' roll hits, country song, whatever. Nothing was sacred and nothing was safe from the Golden Throats. Because of the exposure from the Rhino series, some of these unintentionally hilarious songsters became notorious and ironically hip. Think William Shatner -- the Elvis of the Golden Throats! -- and his over-the-top renditions of "Lucy in the Sky with Diamonds" and "Mr. Tambourine Man." Think Muhammad Ali, whose musical career I covered a few weeks ago on Wacky Wednesday. But there are so many more. Let's hear some of them. Here's a little Kojack Kountry with Telly Savalas. We love ya, baby! Jackie Chan croons the theme to CZ 12 aka Chinese Zodiac, a 2012 movie. He does his own stunts in the recording studio too. Walter Brennan, makes "Ruby Don't Take Your Love to Town" a Walter Brennan song. This Golden Throat, Everett McKinley Dirksen, came from the U.S. Senate. This actually was a hit record during the Vietnam War. And the Golden Throats will never die. Just a few years ago Scarlett Johannsson recorded an entire album of Tom Waits songs. Here is one of those.